Salon I’ma is there just like a lantern of the forgotten street which is burning miraculously. 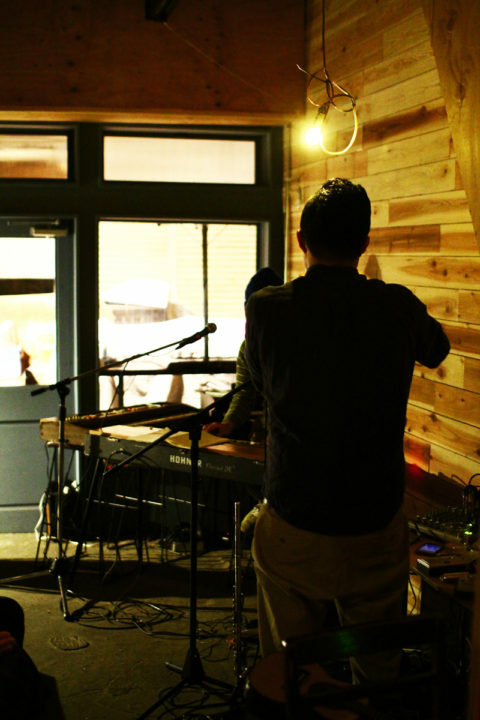 Keyboard, flute, ukulele, harmonica, toy piano, vocal and etc… such various instruments were played by only two men at the space renovated by the owner himself. I felt I was touching to the “sound” which was just born rather than to say I was listening to the “music”. The outside of the entrance was so mysterious and it was acting like a stage setting prepared for the the event. With a help of a bit of alcohol, I wondered “Where is here? When is it now? What am I doing now?”. Although I took the same way as I took on the way coming to this place, somehow I was smiling a bit and felt I was taking a different way on the way back home and wondered is this because of the alcohol as well or not. This was my first visiting Salon I’ma, this space is taking place various kind of events like a talk event, art exhibition and so on. I’d like to visit here again and would like to soak myself into this mysterious moment. Photo: The concert at Salon I’ma.